Recruiting board members? Make a list. I’ve found that one of the reasons nonprofits have such a hard time recruiting good board members is that they start from scratch every time nomination season rolls around. Here’s a small tip that can help: Keep an ongoing list of candidates. Who should we put on the list? Anyone you have or might ever want to consider to be on your board. How do we come up with the names? Then, start looking for anyone you think might fit one of those profiles. The best place to start is in your own donor or volunteer base. Usually your best prospects are people who have already shown interest in you. Ask board members to submit names that might fit the profile. Brainstorm within your governance committee. Throughout the year, keep your eyes open for others — they might have been mentioned in a newspaper or radio article, or you met them at a networking or other event. If you are really stuck, you can ask people who know people to help you brainstorm. (More on that in a later post). Now is not the time to start qualifying people. You can do that later. What should be in the list? Basic contact data. Include the name, title and organization (if any) and email, phone and any other contact information you have. Notes on your outreach to this candidate: Who met with them? When? What happened at that meeting? Did he or she have any interest in serving on the board or a board committee? This next cycle? Sometime in the future? Keep a running ledger of contacts so that future governance committees can refer to your work. Any other information you think would be relevant to making good decisions, now or in the future. You may want to list other boards that your candidate is serving on, when those terms will expire, if they’ve ever served as an officer or never been on a board before. Or maybe indicate that someone might make a great officer someday. Where should we keep the list? The list should be for the “eyes only” of your Governance (or nominating) Committee. Find a protected place that is accessible only to your committee members. With luck, your board has already established an online hub. You can set it up as a collaborative document so that committee members can add updates to the profiles. If you don’t have a dedicated hub for board members, there are free tools such as Google Documents or paid services such as Basecamp or BoardEffect that you can use. 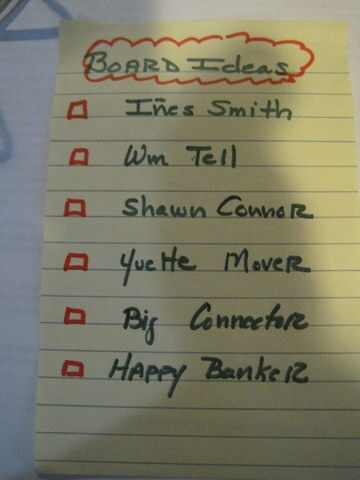 (We’d love to hear what your board members are using to collaborate online). How long should we keep the list? Forever. Well, maybe not forever, but for a long time. Each year you can add new candidates, check for candidates who suggested that they were too busy at the time but wanted to be contacted again, or move people to an “inactive” or “on board” status. You’ll create a useful legacy for governance committees to come. 9 responses to Recruiting board members? Make a list. Love this simple suggestion and the perspective that list-building is an ongoing process. Also appreciate the distinction that it’s not time to qualifying people yet, just gathering them on the list. I think too often boards hastily pare down the list before folks have been given proper consideration. Karen, so true about not paring the list prematurely. I’ve just been having this same discussion with a governance committee I sit on. When a few names have been mentioned, someone will say “Oh she’d be fabulous but she’s so busy she’d never do this.” Let the person decide for themselves, don’t assume. Your organization may be the one they have been waiting form. (I also hear this said about donors — or, “they don’t have any money. Or they’d never be able to make a gift of…” Let them decide for themselves what they are capable of. Great advice, Gayle. Any strategy that keeps us from starting from scratch each year is excellent. I want to expand on your idea of names from the newspaper. I have seen successful recruiting from the business updates in local newspaper. For example, when the bank announces someone new in a position from out of town, it is a good time to add a name. A new professional in town doesn’t have commitments to a number of organizations and he/she is surely looking to meet people. Great idea Sherry. I’m a big fan of trolling the local business newspaper or other specialty pubs as well. What a terrific, practical series of steps. It’s so helpful to break everything down into simple steps. I’m chair of the Board Governance Committee of my favorite organization and we keep a running list too. But it’s in our heads. It would be a terrific idea to keep it on an online hub like you recommend. We are working toward developing a “bench” of possible board members who we are developing and watching. Thanks Gail for your practical advice! It’s so easy to overlook the obvious, isn’t it? I learn so much from the practical advice from all of my colleagues and I’m glad to share this with you.